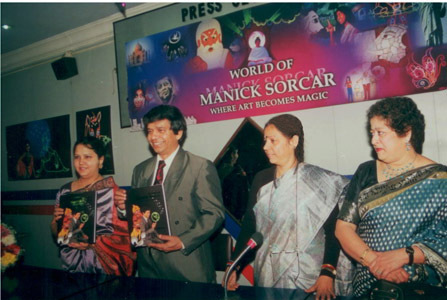 It became a historic event when the book World of Manick Sorcar: Where Art Becomes Magic authored by Roma Sur was launched at The Kolkata Press Club, India on this day at 4 pm. The event was attended by chief reporters and editors from top newspapers, magazines and TV stations from across the nation, in addition to Roma Sur, Manick and Shikha Sorcar and Prof. Saswati Mazumdar of Jadavpur University. In her speech, Roma Sur explained how her research started in early 2000s when as a class project during her Master's degree course on Mass Communications she and her group selected Manick Sorcar for a two-minute documentary on a celebrity. 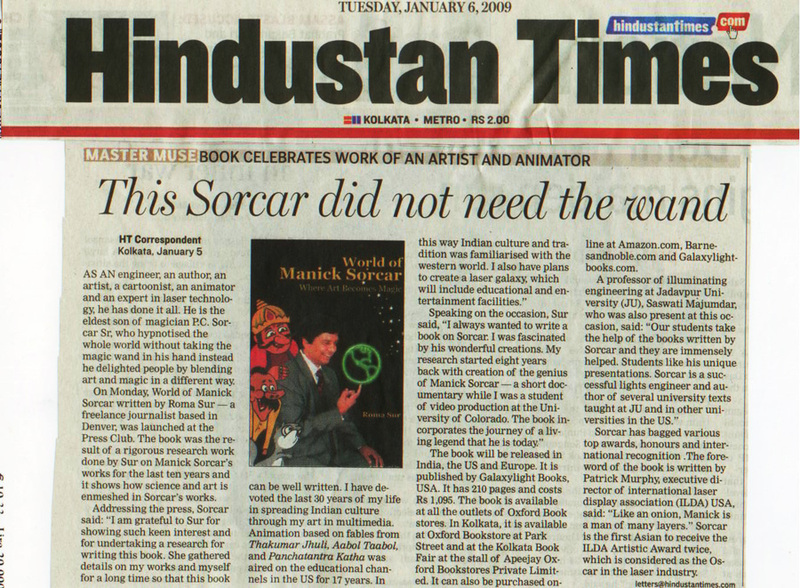 Her work, "The Genius of Manick Sorcar merely captured the tip of the iceburg of this amazing man's work", said Roma Sur, the recipient of the Graduate Student of the Year 2003, "at the time I promised that someday I would try and capture the magic of Mr. Sorcar's work and showcase it in one place". The released book is the outcome of her continuing research that extended almost eight years from the student days. The Foreword of the book is by Patrick Murphy, the Executive Director of International Laser Display Association, USA, who was fascinated with Manick's work in such a wide variety of media: "Like an onion, Manick is a man of many layers. Each is impressive in its own right. The combination is unique....ILDA is fortunate to have Manick Sorcar gracing us with his work. India, America and world are fortunate to experience the unique media of laser, through the vision of Manick Sorcar". Manick Sorcar won the "ILDA Artistic Award" - recognized as the Oscar of laser industry - twice from the International Laser Display Association. He is the first Asian to receive this prestigious award. 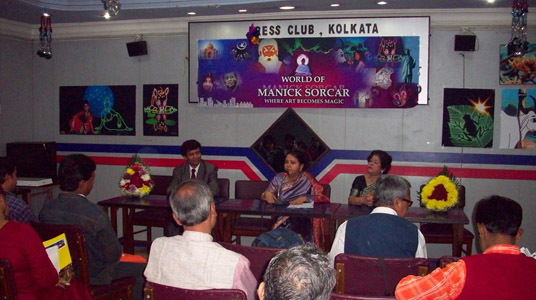 In her speech Dr. Saswati Mazumdar, professor of Illuminating engineering at Jadavpur University who uses Sorcar's books as a text in the classes, said, "Manick Sorcar is a rare species who can blend the highest form of Technology with the highest form of Art. In India, very few people knew about his achievements other than the excellent 'Laser, Animation & Sorcarscope' shows presented by him...But now that we have the book by Roma Sur at hand, we have a kaleidoscopic view of the different facets of the Engineer Artist Manick Sorcar....We, Indians lack courage to recognizing our own people. This splendid work by Roma Sur helps to recognize the magician of Art, Manick Sorcar, eldest son of the Jadusamrat". In India, the book is distributed and available at all Oxford Bookstores across the nation. Roma Sur is a freelance writer based in Denver, Colorado, She has researched and scripted shows for leading national cable channels like Food Network and Home & Garden Television, USA. She has contributed articles for e-magazines and leading magazines including Denver's 5280, Los Angeles's Valley Scene Magazine, and Film India Worldwide. She is the producer and editor of an award winning documentary titled Storytelling Today. The documentary is currently being used as educational material by local libraries. She earned her master's degree in Video Production from University of Denver where she was the recipient of the 'Graduate Student of the Year' award for the year 2003. "In the world of laser displays, there are many producers and few true artists. Manick Sorcar definitely is in the leading ranks of laser artists....ILDA is fortunate to have Manick Sorcar gracing us with his work. India, America and the world are fortunate to experience the unique media of laser, through the vision of Manick Sorcar"
"Manick's magical and artistic biography captured within tome covers"
"This Sorcar did not need the wand. As an engineer, an author, an artist, a cartoonist, an animator and an expert in laser technology, he has done it all. He...hypnotizes the whole world without taking the magic wand in the hand; instead he delighted people by blending art and magic in a different way". "Double life documented. Prafulla Chandra Sorcar could have made himself known as P.C. Sorcar, picked up the wand and made living as the edest son of legendary magician. But he chose to get on with a different name - Manick; in a different land - America; and with a different craft - laser animation....The US has seen a lot of his work - earning him a plethora of awards including multiple International Laser Display Association crowns...Written by Roma Sur, the book is a sketchbook where each facet of Sorcar's personality is illustrated with photographs, newspaper cuttings and his own creations, be it cartoons, collages, storyboards, and pictures of crowning moments". In India, this book is currently available nationwide through all Oxford Bookstores. Internationally, it is available through Amazon.com and other bookstores (Target, Tattered Cover Bookstore etc. ).